The notoriously fragmented universe of upstart electronic bond trading platforms that aim to address “the lack of liquidity” concerns voiced by institutional fund managers and deliver e-bond trading tools that enhance transparency and make trading fixed income products easier for buysiders is starting to consolidate. 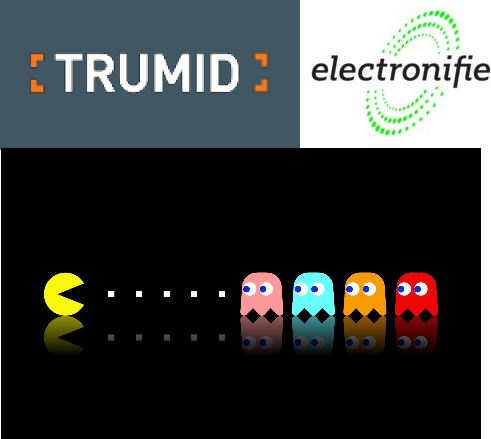 This week Trumid, founded in 2014 and funded by among others VC icon Peter Thiel and investor George Soros announced the acquisition of competitor Electronifie, founded by former Goldman Sachs ‘braniac’ fixed income trader Amar Kuchinad. 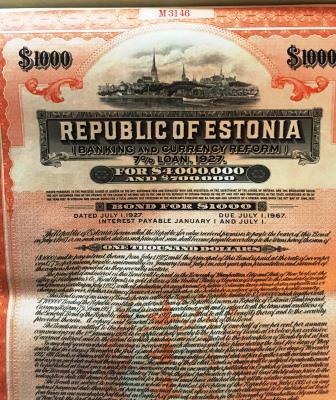 Electronifie, also founded in 2014 has been fixed on delivering an “all-to-all” round-lot trading platform for investment grade corporate bonds. Fintech merchant bank SenaHill Partners, which spearheaded the initial funding round for Trumid during its startup phase and was later engaged by Electronifie to assist in identifying strategic investors, brought the two companies together for transaction. SenaHill Securities served as financial and strategic adviser to Electronifie in the transaction. Upon closing, over 350 institutions will be on board Trumid Market Center, the company’s all-to-all trading network for corporate bonds. 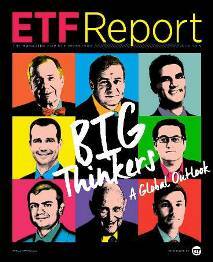 This includes 20 of the top 25 asset managers in the world and 60 broker-dealers. Following a regulatory approval process, Trumid expects the transaction to close early in the second quarter of 2017. Terms of the transaction were not disclosed. Trumid recently closed a USD28 million capital raise, with participation from existing lead investors Thiel and Soros, as well as from new partners including CreditEase Fintech Investment Fund. With this capital, Trumid will continue to proactively grow and improve its offering, including its data science effort Trumid Labs, expansion of its salesforce, and development of new products. Those of us who have worked in and/or around the world of electronic trading for more than 15 minutes readily know about REDI, the ubiquitous direct access execution platform for stocks and options that was introduced by Spear Leeds & Kellogg in 1987 to its professional clearing customers, a universe that grew to thousands of professional traders across the globe. For those not old enough to remember Spear Leeds aka SLK, it was one of the financial industry’s largest specialist firms with it biggest boots on the ground on the NYSE and Amex, and for decades, one of the largest clearing agents for stock and options exchange members and upstairs prop traders. SLK was also one of the industry’s most recognized upstairs market-makers until being acquired by Goldman Sachs in 2000 for a whopping $6.5bil. For those in the know, Goldman’s record-setting acquisition was attributed in part to a fellow by the name of Neil DeSena, “a boy from Bayonne” whose name was synonymous with REDI from the day it was first introduced in 1987, to the day the platform came under Goldman Sachs stewardship, to the day in 2016 when REDI was sold by GS for $1bil to Reuters Plc, and for every day in between, including now, when a trader somewhere in the world uses REDI to send a buy or sell order for stocks, options and/or futures into the now global OEMS platform. History has already shown that the usually prescient Goldman Sachs wanted not only SLK’s prop-trading business and its clearing customers-which delivered hundreds of millions in high-profit revenue , GS also wanted to be at the forefront of electronic trading and SLK provided that. And, it was Neil DeSena who offered that entree. Until his untimely passing last week, barely three months after celebrating his 52nd birthday, Neil DeSena’s name and the brand name REDI remained forever intertwined, despite the fact that Neil had retired from his role as a Goldman Sachs MD several years ago. It was DeSena who was widely-credited for taking the REDI electronic platform from a closed stock and options order routing system for SLK clearing customers to a a billion-dollar, global OEMS platform synonymous for trading stocks and listed equity options. 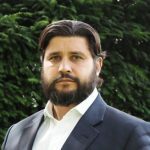 Upon Goldman’s acquisition, Neil became a GS managing director and under their banner, he built REDI into the industry leading global multi-asset trading system, expanding data centers and global networking through Europe and Asia with full interdependency/redundancy, creating a fully 24×7 global institutional trading platform. In 2015, Goldman sold REDI to Reuters for a cool $1bil. Ironically, Neil DeSena was not an inventor, nor a prodigy software wonk, and not an MIT-educated computer geek or a Harvard MBA. Neil came to the financial industry as most did ‘back in the day’; he was a humble, but eager “boy from Bayonne” who came from a middle-class family and like so many others from the hamlets near the world’s trading centers, he aspired to work on Wall Street’s trading floors. As noted in his bio at SenaHill Partners, the fintech merchant bank Neil co-founded in 2013 with Justin Brownhill after retiring from Goldman, Neil’s first Wall Street job was typical to that of other 23 year olds; he scored an entry-level, back-office clerk (for retail broker Quick & Reilly). After rising through the ranks and learning how to leverage technology and lead people, Neil joined SLK in 1992, where he became the first employee of REDI. To the tens of hundreds that Neil since touched throughout his personal and professional life, ‘the rest is history’, but Neil’s history and the legacy he leaves behind cannot go without mention. Neil DeSena was a classic innovator and entrepreneur who always maintained a prescient view when it came to the future of marrying technology and financial markets. He was less a student of technology than he was a student of human behavior and the inherent opportunities that technology-based solutions could provide to one of the world’s biggest industries. 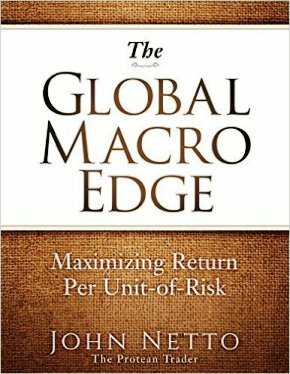 Better than most, including the legions of Wall Street technology and business development gurus, Neil had an innate and intimate understanding of the the mindset of those who navigated stock and options marts and what they would need to be more efficient and more effective, before those savvy-traders knew themselves. 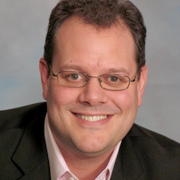 It was Neil’s thought-leadership, his uncanny ability to gain the trust and confidence of those around him, his foresight as to how/where/why technology could be leveraged, and perhaps most of his all, his endearing personality and sense of integrity that served as a benchmark for so many people he encountered. Never one to rest on his laurels and certainly not like so many from the finance industry who aspire to build wealth for themselves and retire to a life of luxury, when Neil left Goldman Sachs, it took little time to decide “What’s Next?” Joining hands with Justin Brownill, one of the trading tech industry’s most successful entrepreneurs, the two formed SenaHill Partners in 2013 and framed the firm to be one of the very first fintech merchant banks focused on fostering upstart and industry disrupting financial technology firms. Since the firm’s creation barely four years later, more than two dozen finance industry tech pioneers have joined as network advisory board members; each contributing expertise, relationships and insight in their respective areas and helping to review nearly 2500 business plans submitted to SenaHill. The collective of professionals has gained the attention of finance industry and tech industry titans and has put wind behind the sails of dozens of disruptive startups focused on areas from bitcoin and distributed ledger to financial-flavored media platforms. Identifying the top fintech financiers is no easy task these days. 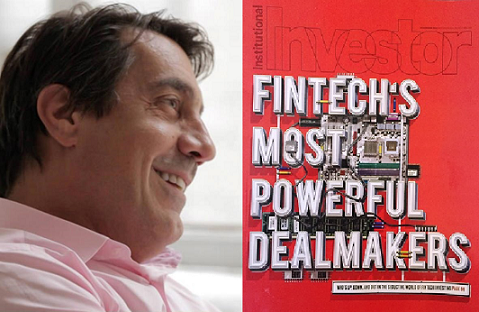 It seems like only yesterday when MarketsMuse curators were among the first to advance the phrase “fintech” in the course of profiling startups seeking to disrupt the financial services sect, many of which have been led by sell-side veterans who made their best trades building innovative financial technology applications for bulge bracket banks and institutional brokerage platforms. At the outset of this now mainstream trend towards disruption of legacy financial technology tools and applications, fintech was a label given to trading system firms; now it is a ubiquitous moniker used to categorize a full-blown industry that counts more than 3000 start-ups and fast growing enterprises across the globe. Fintech is still the term used to to describe fast-moving firms that deliver Web 3.0 trading system and institutional broker tools, but also now includes enterprises that have brought peer-to-peer lending, crypto currency, distributed ledger companies and other offerings that are rapidly changing the way financial industry firms operate, and more important, the behavior of end-users across the globe. Along the way, this evolution has also created a cottage industry of bankers, private equity firms and VCs who share the catchphrase “What’s Next?” and whose respective vision is focused on the “next great thing” within the context of the way we interact when conducting a financial-centric task. With that, its no surprise that Institutional Investor Magazine, which for years has been the harbinger of the financial industry’s best-in-class people (e.g. Institutional Investor All America Research Team is the bible used to benchmark equity and fixed income research analysts) has more recently started tracking the top funders and dealmakers from across the fintech ecosystem via II’s Annual Fintech Finance 35. And, hot off the press: II’s 2016 Top Influencers in Fintech Finance! With 35 top guns highlighted, MarketsMuse team arbitrarily picked out one of the profiles from the middle of list of 35 to share with our readers. 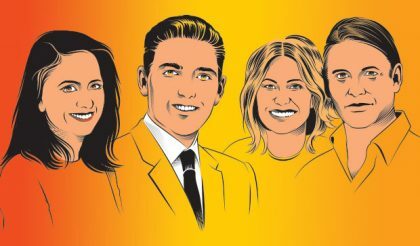 The folks who have risen from last year’s #19 spot to this year’s #16 spot are the principals of SenaHill Partners, which is arguably one of the fintech industry’s leading pioneers. 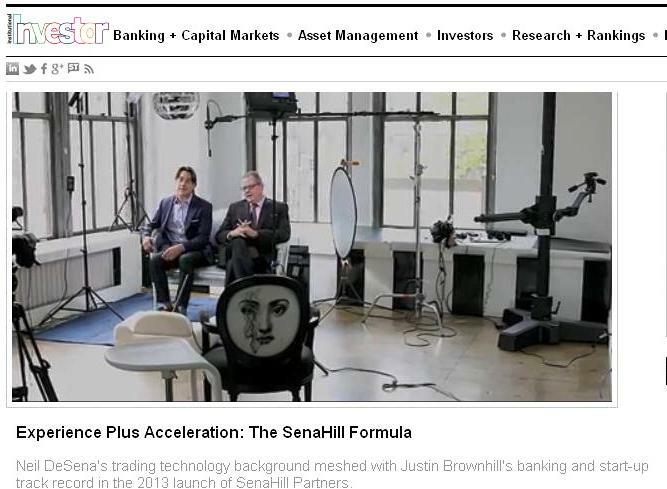 SenaHill positions itself as part investment bank, part PE investor, part adviser and part incubator. Below is the excerpt courtesy of II’s Jeffrey Kutler. The Fintech Finance 35 will be honored at the iiFintech Awards taking place on December 1. The awards program was designed to bring together the honorees of the Tech 50, Fintech Finance 35, and Trading Technology 40 to explore how financial technology will continue to transform the industry. Being a fintech thought-leader is ‘non-trivial’ as they say in the software world, but expressing vision, domain fluency and passion is arguably the first step that any aspiring thought leader, or for that matter, any already-established banker who navigates the deal world of Wall Street and surrounding areas needs to master–before believing that you can simply send a deck and get a check for A-round funding..
Taken from the playbook of MarketsMuse mentors at The JLC Group, “Sizzle Reel Strategy 201-How ‘old-style’ Wall Street firm uses contemporary, new media approach to burnishing their brand..”, below is a solid example of how merchant bank SenaHill Partners is rapidly becoming one of the top five firms in the rapidly evolving fintech universe. Anyone who has followed the blog posts from The JLC Group for more than 15 minutes during any part of the last 10 years already knows that corporate make-over artisan has long advocated the use of digital media tools that incorporate sight, sound and motion as a way for enterprise executives to tell your brand story and frame your value proposition…Throughout the ad agency hallways in “LaLa Land” as well as along Madison Avenue, short-feature video, often known as ‘sizzle reels’ pack a punch that enables aspiring brands and thought leaders to fight above their weight class. The following ‘reel’ is a perfect illustration of this simple point. When Justin Brownhill wants to check up on one of his latest investments through fintech merchant bank SenaHill Partners LP, he only needs to check the ledger unpinning bitcoin. The address: block 368396. That’s the new digital home for the equity stake his firm made in Symbiont, a startup using bitcoin’s underlying blockchain software to make it quicker and easier to prove ownership of assets or transfer them between buyers and sellers. Putting its money where its mouth is, Symbiont on Tuesday morning digitized and published several of its equity investments to the blockchain, which drives the bitcoin digital currency. That means the stakes will forever be part of that public record, allowing dividend payments or stock-option conversions to happen automatically. “I woke up this morning and thought, ‘This is a historic moment,’” Brownhill, a managing partner at New York-based SenaHill, said in an interview after the Symbiont presentation on Tuesday. The merchant bank has investments in over a dozen other private companies. “Our job now is to go and espouse the benefits to all our portfolio companies,” he said. Wall Street is becoming enamored with the potentially transformational way blockchain could overhaul how derivatives, bonds, loans and other asset classes work, dramatically simplifying the process of tracking ownership and accelerating the transfer of assets from one person to another. 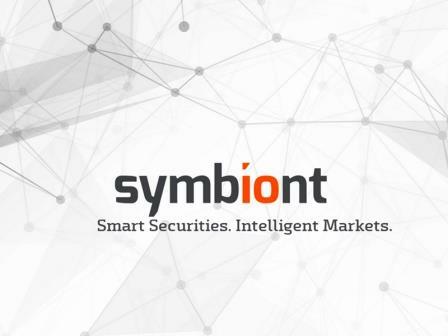 Symbiont’s innovation is creating what it calls smart securities. The company is now practicing what it preaches: its founders’ stakes as well as shares and options granted to employees have been converted into encrypted code that lives in the bitcoin blockchain — the same ledger where any purchases and sales of the digital currency are recorded. Symbiont customers can do likewise to track changes in ownership interests. “Today is the day crypto joins Wall Street,” Symbiont Chief Executive Officer Mark Smith said to the room full of investors, bankers and reporters in New York. Representatives of JPMorgan Chase & Co., Morgan Stanley and other financial institutions were among the audience members. 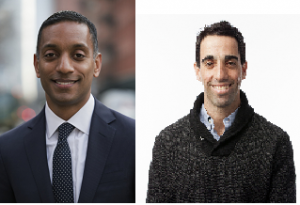 Symbiont’s not alone in trying to bring the blockchain to Wall Street. Other firms investigating finance-related uses of blockchain include Digital Asset Holdings LLC, headed by former JPMorgan Chase & Co. banker Blythe Masters; Nasdaq OMX Group Inc.; Ripple Labs; and the New York Stock Exchange. In June, Symbiont raised $1.25 million from a group of investors including former NYSE chief Duncan Niederauer; former Citadel LLC executive Matt Andresen; two co-founders of high-frequency trading firm Getco LLC, Dan Tierney and Stephen Schuler; and SenaHill.